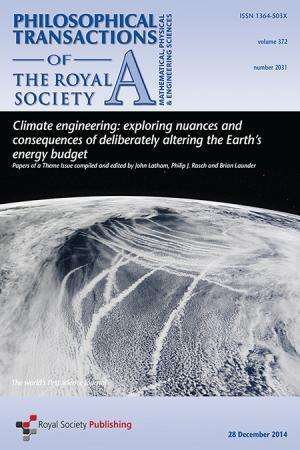 The paper is included in a special issue of Philosophical Transactions of the Royal Society A, compiled and edited by John Latham, NCAR; Philip J. Rasch, PNNL; and Brian Launder, University of Manchester. Cover image courtesy of the journal. For the first time, modeling research led by Pacific Northwest National Laboratory found that atmospheric particles can brighten cold clouds in the Arctic. Using simulations, they showed that low clouds over the Arctic may be brightened by deliberately injecting small particles known as aerosols. It's already well known that injecting aerosols into low clouds over the warm ocean can, in some circumstances, reduce the amount of sunlight that reaches the surface. The concept, untested over the Arctic until now, is called marine cloud brightening, and it can also happen when ships send exhaust into the atmosphere. The modeling simulations by PNNL and collaborators at the National Center for Atmospheric Research (NCAR) and the National Oceanic and Atmospheric Administration (NOAA) used computer modeling to show that Arctic cloud brightening could have considerable local climate effects, but likely would not substantially alter the global energy balance. 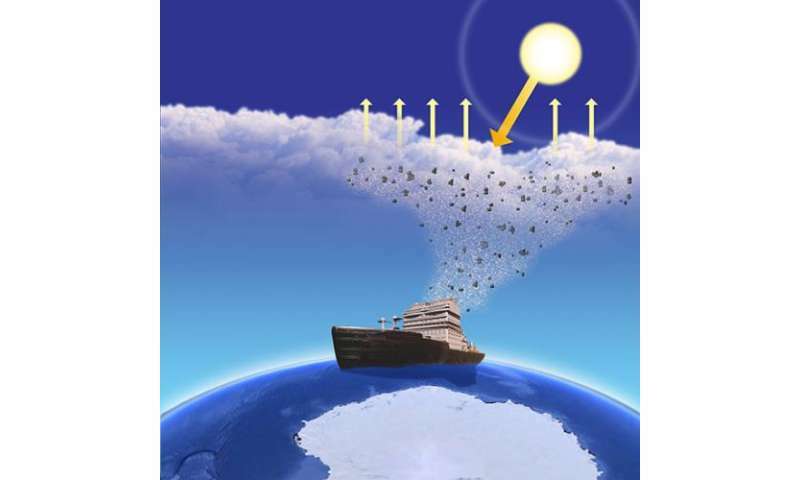 Propositions to shoot sea salt or other tiny particles into low clouds over the ocean have been tested in computer models over temperate regions. Brighter clouds reflect more of the sun's energy back into space, shading and cooling the surface. The concept would amp up a process that happens naturally when sea spray is lofted into the atmosphere from ocean waves. The research team wanted to know, would the same concept work over the Arctic? The answer could matter for the climate, if geoengineering techniques—proposed by some as a temporary way of reducing the climate effects of greenhouse gases while mitigation is in progress—are ever put into practice. PNNL researchers and their collaborators used the Weather Research and Forecasting Model (WRF), a leading community atmospheric model that can resolve clouds and represent many of the complex microphysical interactions between clouds and aerosols. They ran eight cases, in clean to polluted atmospheres, and simulated injection of aerosol particles into the atmosphere. Their simulations showed the particle impacts in a wide variety of background conditions. In this study, the researchers looked at idealized cases. For example, they did not allow for initial wind, which would blow clouds and particles around, although wind was allowed to develop over the course of the simulation. But the Arctic is windy, so how did that choice affect the results? What happens if the wind blows the particles across the entire simulation area and doesn't keep them in a straight line? The next few studies will look at the impacts of these and other research assumptions. "This work is also relevant if Arctic sea ice melts and more ships pass through the Arctic," said Dr. Ben Kravitz, atmospheric scientist at PNNL and lead author. "Because ship plumes—instigated by particles from diesel engine exhaust—can also generate trails of bright clouds."